We were caught off guard as we stepped inside the St Denis Cathedral in northern Paris yesterday. 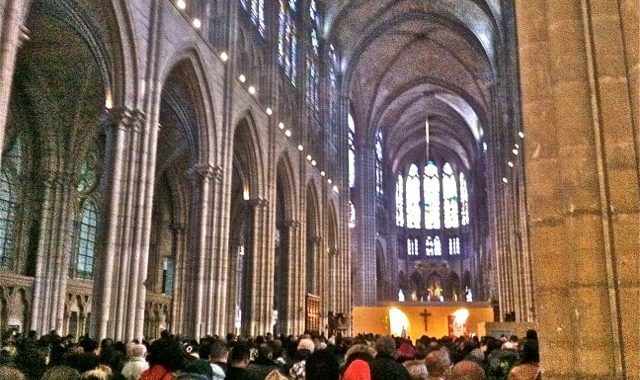 After spending the weekend in dialogue with missionary couples working among secular, unchurched Parisians, we expected to encounter the stereotype of Christianity today, a huge empty cathedral with perhaps a few old women praying before the altar. To round off our Heritage Forum this weekend in the French capital, a group of us decided to visit the world’s first Gothic structure, hoping to sneak a glimpse of the architectural features and the royal tombs inside before the Sunday morning mass with the faithful few began. As we approached the imposing western entrance, vendors of palm branches outside reminded us that it was a special day on the church calendar, Palm Sunday. Official visiting hours didn’t start until noon, so we duly purchased some camouflage before stepping through the portal. Entering the sanctuary itself, we saw the mass was already underway. The whole building was full, overflowing into the aisles. People were standing everywhere, to the very rear of the nave. Voices from the front read the Passion narrative accompanied by the organ. Liturgical responses engaged the whole congregation in the story who reverently and intently focused on the proceedings. But the most arresting sight that greeted us was that the congregation was overwhelmingly black, with only a smattering of white faces. The title of Philip Jenkins’ book, The New Faces of Christianity (2008), came to mind as I began to adjust my understanding of the French church today. 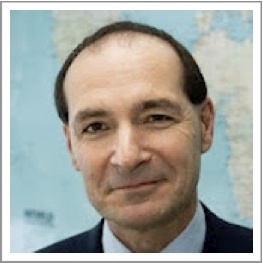 Jenkins’ earlier ground-breaking book, The Next Christendom (2002), had highlighted the shift of Christianity’s center of gravity to the south, so that Africa was becoming home to the world’s largest Christian populations. In his New Faces sequel, Jenkins explained why many Christians of the global South so identified with the world portrayed in the New Testament: an agricultural world marked by famine and plague, poverty and exile, where belief in spirits and witchcraft were commonplace and persecution was rife as today in Nigeria and Sudan. The Bible spoke to them with an authenticity lost on most in the industrialized North. While aware of the contribution of migrants to the urban renewal of evangelical churches in Europe from Spain to Sweden, I was now witnessing the Catholic version of revitalisation via emigration from former colonies. What we saw before our eyes was partial evidence that roughly half of all migrants into the EU come as practising church members. As I surveyed the scene before me, the tall slender cluster pillars forcing my gaze upwards to the large colourful stained-glass pointed windows and the vaulted ceilings above, I reflected on the centuries of history this building had witnessed: the saints and the royal dynasties represented by the stone effigies lying in the transept below, starting with the first bishop-martyr Saint Denis himself; the French Revolution which destroyed the original windows and labelled the architectural style initiated here and spread around the world as ‘gothic’ or barbarian; the impact of modernity last century and the dwindling of the congregations; and now this wave of migrant Christianity. However, as one of our group cautioned, while we could rejoice in this fruit of the success of the missionary movement in Africa in the last century, the reality was that these migrant churches were seen as foreign to the French, who either disregarded or feared them. Two major challenges remained. Firstly, how could we prepare these migrant believers and their children for the inevitable onslaught of modernity? Secondly, how could we find new, non-traditional ways to reach the secularized and unresponsive Europeans, such as the Parisians, and not simply focus on the most responsive sectors? We had gathered in Paris to share our stories and journeys towards the rediscovery of God’s hand in European history. We were now returning home encouraged by remembering how the Spirit of God had renewed his Church repeatedly through faithful minorities, yet challenged to find fresh ways to bring the Easter message to a secularized Europe.